Rosh Hanikra is a very beautiful place in Northern Israel. (צפון ישראל) It lies on the coast of the Mediterranean Sea. (ים התיכון) The most important attraction is the grottos, (ניקרה) caves that are even now still being carved out of the rock by the action of the waves. Historically, Northern Israel was a passage way for people and armies, to make their way south to Egypt. Many peoples traveled through this country, amazed at the beauty of the coast. Ancient peoples such as the Sidionians and the Phoenicians lived in this area. The grottos themselves are a national park. You can hike there or take a cable car. The cable car is one of the steepest in the world, it has a gradient of 60 degrees. (מעלות) Then you get out of the cable car, and go on a short 200 meter walk. This takes you to the grottos. Be sure to wear waterproof (נגד מים) clothing as the sea spray can be very cold. In fact, if you visit in the winter on a windy day, the views will be even more spectacular! The grottos are lit even at night (לילה), so you can stay after dark and enjoy the view. There is more to see at the Visitors’ Center. There is a sound and light show, where you can learn about the history (היסטוריה) of the site. The exhibit shows how the British quarried the rock to expand the train line, see the wildlife that inhabits the grottos and see how they were formed. Enjoy your trip to Rosh Hanikra and be sure to take some pictures (תמנות). One recent movie “We are not Alone” (אנחנו לא לבד) features a security guard (שומר) at the entrance to a large mall (קניון). This movie is sweet and follows his adventures and falls in love. The cinematography is realistic, the situation is uniquely Israeli. (ישראלי) Watch the trailer below. Movies about the Charedi (חרדי), Religious Jews, often have as their undercurrent a negative image. Remember “Kadosh” (קדוש) from a few years ago? (לפני כמה שנים) This movie was in bad taste, and made people draw away from religion. Another movie, Ushpizin (אושפיזין) was a winner though. The plot (עלילה) was far fetched, but it was well received. Now, a new movie, Filling the Void, is a diamond (יהלום). The plot is very simple, but the emotional impact is tremendous. The leading Actress, (שחקנית) Hadas Yaron was nominated for the Venice Vopli best Actress Award. This movie treats the subject delicately, and in good taste. Eretz Bereshit, an Israeli National Geographic style movie, shows different animals (חיות) and climates of Israel. It is a winner, still being popular after two years. It is great for kids, my 11 year old son was shown it during Nature class (שיעור טבע) at school, and he can’t stop talking about it! Dudu Fisher is a world famous Israeli singer (זמר) and actor (שחקן). He starred in the Hebrew Language version of the hit musical Les Miserables, and to this day continues to do concerts all over the world. Few people know that he is religious (דתי) and started his career as a cantor (חזן) in his synagogue in Tel Aviv, Israel. He was in the Yom Kippur War (מלחמת יום כפור) and after discharge, he studied music at the Tel Aviv Academy of Music. He studied under Shlomo Ravitz, and became the cantor at the Great Synagogue in Tel Aviv. He would have remained a cantor all his life, but for attending a performance (הצגה) of Les Misrables in London. When he heard about a Hebrew Language version, he auditioned for the part, even though he knew nothing about acting. He went on to play the part of Jean Valjean for three years. He went on to play on Broadway and for the Queen of England. He has performed for The Thai royal family, The President of the United States and with David D’or, for the Pope. He continues to tour and has a new show called “Jerusalem” where he pays tribute to the most Holy City in the world. He recorded numerous CD’s including a series for children called Dudu Fisher’s Kindergarten on DVD, which delight children (ילדים) of all ages. Sukkot (סוכות) is called the happiest Jewish holiday of the year. It comes in the Autumn (סתיו), when the weather is cooling down, and the mornings and evenings are cool and comfortable. It is a time for families (משפחות) to get together, visiting friends, and eating good food in the Sukka. The holiday of Sukkot lasts for seven days, and during this time, Israelis take off from work to spend quality time with family and friends. A Sukka is a temporary hut or structure that is built outside the house either on a porch (מרפסת) or in an open place. There are many Jewish laws about where a sukka can be built. One of the most important laws is that the area above the roof (גג) of the sukka has to be clear of all obstructions. What do you do in a Sukka? According to Jewish custom, you have to eat (לאכול) and sleep (לשון) in the sukka. This is what makes it a temporary “dwelling.” Many people have the custom not to take trips during this time, and to study Torah in the Sukka. Others travel, eating meals only in a Sukka. A lot of restaurants in Israel build a Sukka so that their customers can do the Mitzva (מצווה) of eating in a sukka even when not at home. The Etrog (אתרוג), Lulav,(לולב) Myrtle,(הדסים) and Willow (ערבה) are very important symbols for Sukkot. These are waved everyday while praying, in the synagogue. Each has different attibutes, the Etrog is a lemon type fruit with a very thick skin, the Lulav is an immature palm branch. When you wave the Lulav, it makes a sound. The Myrtle is a branch with small leaves and has a nice smell. The Willow branch has neither taste or smell. We bless them all together to symbolize all the attributes (סמל) of a human being. 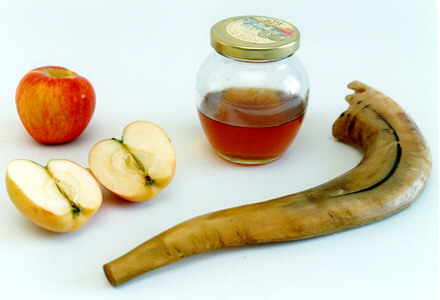 Rosh Hashana (ראש השנה) is the Jewish New Year. In Israel Rosh Hashana is a two day holiday, just like it is all around the world. It is a time of joy, but also of introspection. We look at our deeds from the past year and start the process to begin anew. The Kiddush (קידוש) blessing is said on the wine, and the blessing is said over the Challah(חלה) loaf, but instead of putting salt on the Challah, it is dipped(לטבול) in honey (דבש). Each person takes a piece of bread with honey and takes a bite. There are many foods that are considered good luck omens. Apples(תפוח), fennugreek, or carrots(גזר), leeks or cabbage(כרוב), beets(סלק), dates(תמר), gourd (רוביא), pomegranate(רימון) and fish, and the head of a sheep (כבש) or fish(דג) are the most important foods. Each food has a special blessing said over it by all the people at the table. Some of the omens are positive and some are negative. For apples we wish each other a good and sweet New Year. For the Carrots or fenugreek, we want our merits to increase. Pomegranates are especially good, may our merits be as many as there are seeds in this fruit! The negative omens, beets, leek, and dates, signify that our enemies be decimated, removed, or consumed. The last omen of the Seder is the fish and the head of a sheep or a fish. These signify that we be fruitful and mulitply like fish and the head of the fish, that we should be like the head and not the tail. Have fun during Rosh Hashana, and remember to eat a bit of each food to savor the special flavor of the Sweet New Year! 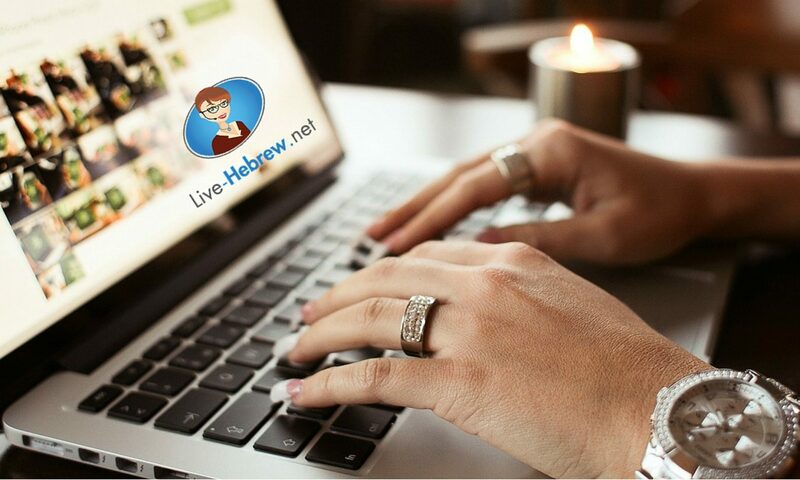 May you have a Sweet New Year(שנה חדשה) with lots of blessings(ברכות) and new opportunites to learn Hebrew at Live-Hebrew.net! Israel is a Mediterraean country, it shares the climate (מזג אוויר) and the food (אוכל). Many Israeli foods are similar to the surrounding cusines. One of the most famous Israeli foods is the Felafel. (פלאפל) This dish is made up of ground chickpeas, that are made into small balls, and then fried. Then it is put inside a pita,(פיתה) which is a small round bread that opens up and is filled with salad (סלט), usually cut up tomatoes, and cucumbers. The main topping is techina (טחינה) which is ground sesame seeds in a sauce, and topped off with French fries. Many Israeli foods are centered upon the Seven species (שבעת המינים) that are traditionally thought to be native to the Land of Israel. Olives, figs, dates, pomegranates, wheat, barley and grapes, all figure prominetly in the Israeli kitchen. There are many different types of olives, which when pickeled all taste different! These foods are also important for the Jewish holidays (החגים), the grape for Shabbat in the form of wine, wheat is made into many different types of cakes and pastries, and dates are also made into luscious cakes. Stuffed grape leaves with rice and spices is also a favorite side dish. Eggplant (חציל) was a main staple of the diet of the pioneers of the State of Israel. It was made into many different foods, such as “chopped liver,” (כבד קצוץ) and used as well as a substitute for meat. The “chopped liver” was made from a smoked eggplant, baked over the open flame of the stove, and then mixed with black olives and peas. I’ve made it, not bad tasting. It is good for those who want to be vegetarian and get the consistency of meat. Israeli food continues to evolve and change as the culture of the people who live in Israel continue to experiment in the kitchen. One of the things that you have to do when you come on Aliyah is to choose a bank (בנק). There are many different banks (בנקים) that have different hours and services. One thing that you should know that most banks are closed (סגורים) on Fridays and Saturdays. They also have opening hours two afternoons a week. The amount of the monthly fee and the individual transation fee is also different for each bank. Most banks charge from 10-15 NIS a month plus a charge for each transation. That is you pay each time you deposit money, and when you write a check. Make sure that you take this into account when your are planning your budget. The post office also has a bank, and if you want to open up a post office account, it costs 50NIS. The major advantage of a post office bank account is that it is open all the time the post office is open, and you can go into any post office to deposit (להפקיד ) and withdraw funds. Most banks have branches ( סניפים) in individual neighorhoods, so even if the fees are higher, there is the added convience of being able to walk to go to the bank. This can save you time (זמן) and money (כסף). In order to open a bank account, you need to have your Israeli Identification card, either an Israeli check or cash. You will need to sign a lot of documents, that are in Hebrew that tell about all your rights, and the fees that are charged by the bank. In the postal bank, you have to wait a week until you are able to deposit any money into the account (חשבון). Israel does not have a language (שפה) requirement, however it is a good idea to know Hebrew (עברית) before coming on Aliyah(עליה). Some countries have a language requirement for new immigrants. If you want to become a citizen of Great Britain, you have to pass an English language test. If you are making Aliyah from another country (ארץ) and have started the process there, then the Jewish Agency personnel will speak your language. 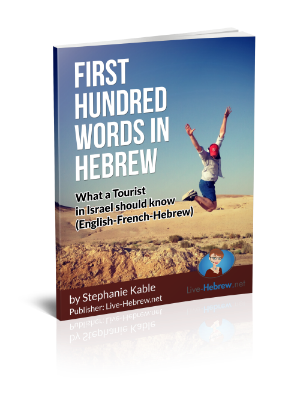 But from the moment (הרגע) that you land in Israel, the government officials most likely will only speak Hebrew. You need to be able to communicate (לתקשר) and get your needs met by speaking Hebrew. Even getting enrolled into an Ulpan, (אולפן) the Hebrew language school that the Jewish Agency (סוכנות) offers, you need to speak a bit of Hebrew to complete the paperwork (ניירת). Then once you are in class (בשיעור), you will learn more Hebrew. You will be able to be in a higher level class if you have learned Hebrew beforehand (לפני). For example(לדוגמה), I was able to at least read Hebrew before I enrolled into the Ulpan. So instead of being in a lower level class, I was in the highest level class and when I graduated, I was able to go and get a job right away. My mother, on the other hand, didn’t know any Hebrew, so she was in a lower level class and didn’t have the skills to get a job when she graduated. If you are not offered a Absorption Center (מרכז קליטה) apartment, you will need to find housing for yourself and your family. Even though English (אנגלית) is a required subject in the Israeli school דsystem, not many Israelis really remember their high school English. The rental contracts are all in Hebrew, and it is best to be able to read the contract (חוזה) yourself and not have to rely upon (לסמוך על ) a friend to translate (לתרגם) for you. Even if you are in Ulpan, and the classes are provided to you by the Sochnut, you still might need to work (לעבוד), at least part time (משרה חלקית) You will be better able to work, if you have learned Hebrew. In conclusion, because of all these factors, it is a very good idea to learn Hebrew before you come on Aliyah. The Primary School System in Israel is based on 6 years, like in the United States. There are three separate school systems in Israel. Non-religious (ממלכתי), National Religious(ממלכתי דתי) and Independent (עצמאי) which is the Charedi (חרדי) school system. The curriculum is set for the non religious schools and the National Religious schools of Hebrew, Math, History of Israel, Science and Bible, English is added in the Fourth Grade. The Dati Leumi (דתי לאומי) adds religious subjects such as Talmud (תלמוד), Mishnah (משנה), Prayer (תפילה). The Independent school system sets its own curriculum of mostly Religious subjects of Talmud, Mishnah, Prayer, Math, and only a little of secular subjects, each school decides what to teach. Parents first send their children to Gan Hova (גן חובה) or kindergarten, which the children learn the basic Hebrew letters, and numbers, they are taught reading readiness, and math readiness, and basic school skills. The first day of school (בית ספר) is always a momentous event in the child’s life. If possible, the parent goes with the child for the first day or at least drops off the child and sits there for a few minutes. Parents take pictures (תמונות) and it is a very happy day. Most parents send their children to schools that are not necessarily in their own neighborhoods (שכונה). There is a system of mini-buses (הסעות) that take children to school. The parents have to make arrangements with the school before school starts to make sure about the time the child needs to be waiting outside the home and where the pickup point will be. Many parents wait (לחכות) with their children to make sure they get on the right mini-bus. School will be starting in a few weeks, there are lots of preparations that have to be made, call the school for the mini-bus, get the book list (רשימת ספרים), buy backpacks (תיק בית ספר), and buy new clothes for school. Wow, that’s a lot of work. I can’t wait for school to start! Northern Israel has lots of places to see! During August, which is the main vacation (חופש) time for Israelis, you can go up North to see all the sights. The weather is nice, just cooling down a bit and the roads are clear of everyday school traffic (תנועה). If you take Route 6, which is the new toll-road, you can get from Jerusalem to Haifa in about an hour and a half. If you take Route 2, you run into the business traffic through Tel Aviv, and Route 4 has traffic lights (רמזורים) when it goes through local towns such as Hadera and Raanna, so it will take you longer. What to see up North! There are many places to see in Northern Israel. One place to be sure to go to is the Golan Heights. ( רמת הגולן) This is the highest place in Israel. In the winter there is even snow on Mount Hermon! When the ski resort is open, it is announced on the National Israel Radio during the news! Another place is the Golan Heights Winery. You can go on a tour of the winery see how they process the grapes. Tours are in many different languages and start throughout the day. It is best to call before to make sure though. At the end of the tour, there is a wine tasting session in which you get to taste all the different kinds of wine that are made in the Winery. Of course all the wines are Kosher for Passover (כשר לפסח)! There is a shop at the end of the tour where you can buy the wines that you just tasted! In Katzrin, you can also go on a tour of the Golan Olive Oil Mill, which is not too far from the winery. At the Olive Oil Mill, you can see both old and new ways of making olive oil. (שמן זית) there is a tour, of the oil making process and a shop where you can buy unusual products made from olives and olive oil. A favorite vacation spot in the North is Tiberius, or Tiveria (טבריה) in Hebrew. This town is considered one of the oldest cities of Israel. Built along the shores of the Kinnert, (הכנרת) also called the Sea of Galilee, there are many things to do. The promenade, has many shops and restaurants overlooking the water. There are many hotels and spas, and boat trips on the lake. The beaches are beautiful and you can even put your deck chair (כסא נוח) in the warm water and relax in style! Tiberius is also the final resting place of Rabbi Moshe Ben Maimon, The Rambam, a major pilgrim site. No trip up North would be complete without going to Tsfat,(צפת) one of the Holy Cities of Israel. Every summer during August the Tsfat Klezmer Festival is held. This year it is a two day event starting on August 20th until August 22. Many performances are free, but the big ones you have to get tickets. You can hear Klezmer music, as well as other kinds of Jewish soul music. Tsfat is also the final resting place of many famous Rabbis and many people go to Tsfat to pray at their gravesites. (קברים) These include Rabbi Yonaton Ben Uziel, Rabbi Yosef Caro, Rabbi Yitzchak Luria, and Rabbi Chaim Vital. Tsfat also has an artists’s colony which was established in the 1960’s. Even now you can visit the workshops (סדנאות) of many artists and buy beautiful art. Haifa is Israel’s modern city on the coast of the Mediterranean. It is the largest city in Northern Israel. Haifa Bay is a business and commercial center. The Port (נמל) of Haifa is very important in Israel’s economy. (כלכלה) There is a huge shopping mall, the biggest in Northern Israel. One of the must see, tourist sites is the Bahai Gardens, located on the side of the mountain. Call to get the current visiting hours. 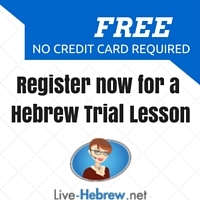 Take some learn Hebrew by Skype with an Israeli teacher and brush up your Hebrew before your trip!